Australia’s Terrene Black has made it two from two on the APP Tour, mirroring her Maui result at the wild and woolly Japan Pro-Am after outlasting Fiona Wylde, Candice Appleby and Sonni Honscheid in a weekend of rollercoaster results and conditions that produced a virtual tie in the small but elite women’s field. The result boosts Terrene into the ultra-exclusive ‘Top Five Club’ on the updated World Rankings, with the Japan Pro-Am scoring 38% on the women’s Race Index. After a brutal, super windy distance race presented athletes with an immense challenge on Saturday, the sprints were a much calmer affair. This flipped the score sheet and left Terrene, Fiona and Candice tied on 5 points in the hunt for the overall event title after points from the two races were combined, while distance winner Sonni was cruelly left just one point further adrift after stumbling to 5th in the sprint race. After saluting in the sprints, Terrene won on a count back* to give Team ECS a big result; the under-rated Aussie (she’s a former Molokai champion, let’s not forget) is looking fit and strong as Season 2017 swings into full gear. Fiona (Starboard/USA) and Candice (Infinity/USA) were strong and consistent all weekend, finishing no worse than 3rd in each race and only missing out on the event title by the narrowest of margins, while the German powerhouse from Team Starboard, Sonni, had to settle for 4th place overall and was left to rue her slow start off the line in the sprints. 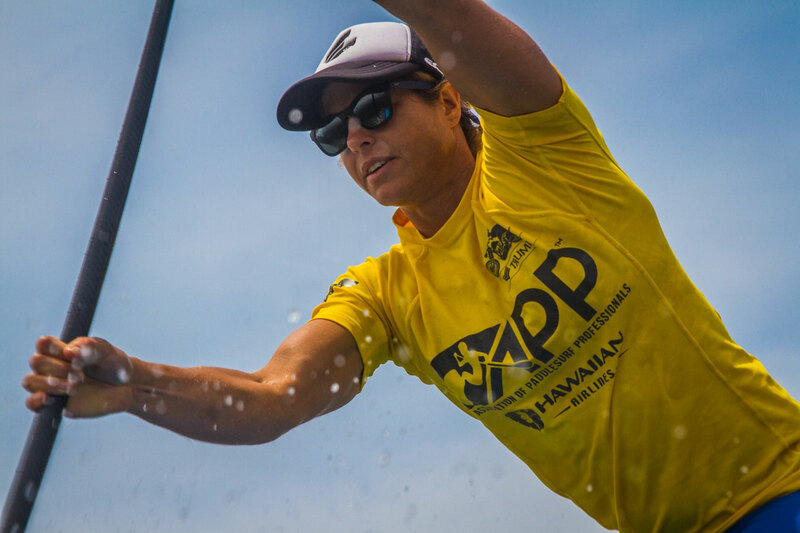 Local dark horse and champion young surfer Yuka Sato gave the home nation something to cheer about by finishing 6th, which was one spot ahead of Australian top 10 ranked athlete Angie Jackson from Team ONE. But ending the weekend ahead of both Yuka and Angie was the impressive Aussie youngster Chloe Walkerdene from Team Infinity. Chloe is yet another product of the highly-elite Gold Coast talent pool and looked sharp in the sprints on Sunday to edge ahead of her seasoned compatriot in a tie-breaker. Chloe is the big mover on the women’s World Rankings this week, jumping +11 to a new career best of #24. On the men’s side it was a battle between the Hawaiian boys all the way, with Connor Baxter (Starboard) and Mo Freitas (Focus) showing their class in trading 1-2 finishes between the distance and sprints. 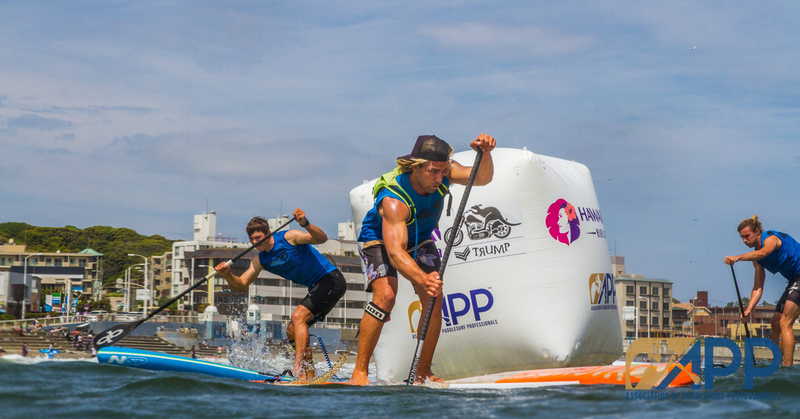 Ironically the distance race, which was the eventual tie-breaker, was itself decided in a sprint to the line as the two superstars surfed the same wave to the shore after more than an hour of headwind/sidewind grinding that. Connor got the nod in that one, but Mo flipped the result on day two to force the overall result into a tie-breaker, which was weighted on the distance race in the case of identical results. The distance race was a real grind on Saturday, with massive time gaps on the results sheet as Japan whipped up some very bumpy conditions. Judging by everyone’s reaction on Instagram, this was the type of brutal and challenging sidewind ocean race that left many paddlers hurting. Although a few of the big names from Carolina were missing this weekend, the sheer dominance of Connor and Mo over the past two days cements their reputation as key members of the ultra exclusive Top Five Club after the Japan Pro-Am clocked in at 47.5% on the men’s Race Index. Mo has jumped back into the #3 spot on the updated World Rankings, while Connor has somehow managed to extend his load on top and is closing in on the seemingly-impossible 300 points barrier. Connor’s current total of 290.00 points highlights just how dominant the Starboard superstar has been over the past 12 months–and for several seasons before that. Connor has not only been world number one for the past 52 weeks straight, he’s been on top for 128 of the 135 weeks that we’ve been officially publishing the World Rankings. Not to be outdone by the Hawaiians, the Aussie contingent was out in force this weekend as well, however it wasn’t the usual suspects that carried the load. 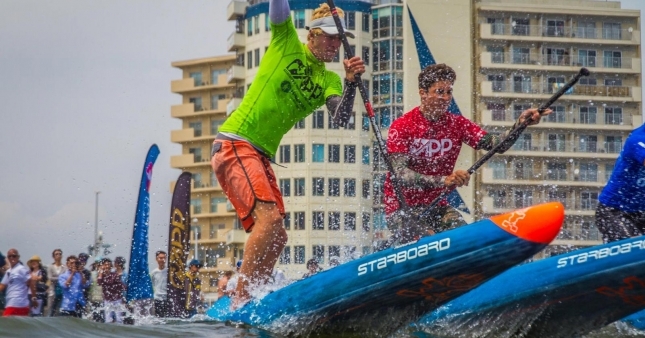 World number two Michael Booth (Starboard) struggled in the wild sidewind conditions on Saturday to finish 7th, the same place he would find himself in on the overall event standings by Sunday evening. After stumbling at both Carolina and Japan, Boothy will now look to bounce back in a big way at the EuroTour starting next week where he’ll be one of the hot favourites alongside team mate Connor Baxter and NSP’s Carolina Cup hero Titouan Puyo (it’s going to be a mouth-watering clash of the titans in Europe this summer). With Boothy absent from the podium, it was left to the highly under-rated Lincoln Dews from Team JM Paddleboards and the freshly-minted OluKai champ from Team Sunova, James ‘Jimmy’ Casey, to give the Hawaiian boys something to worry about and fly the flag for Team Australia. Jimmy picked up a 3rd and a 4th to finish 3rd overall, while Lincoln was right behind in 4th overall after finishing 4th and 6th in the two races. Their consistency between the long and short course events (not to mention their string of big results in Hawaii’s unlimited ocean races over the past few years) shows just how talented these guys are in the water. Jimmy and Linc have flown under the radar a bit over the past few seasons, so I’m stoked to see these two getting the sort of results we all now they’re capable of. Both of them could realistically be ranked top five by the end of the year. Linc’s great result sends him up +6 to world #13, while Jimmy has returned to the top 10 after a brief absence and now sits at a career high #7. Another under-rated name to watch this season is Marcus Hansen from Team NSP, with the reigning New Zealand national champion looking mighty strong to finish 5th in the distance race, however a poor result in the sprints cost him on the overall standings. 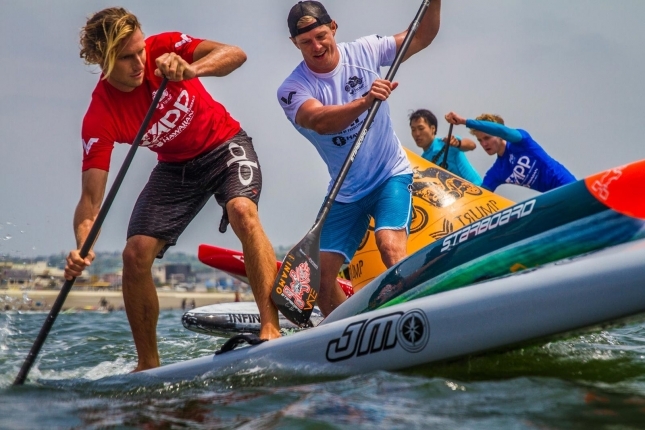 Defending event champ Casper Steinfath couldn’t repeat his heroics from 12 months ago, with the former world #6 from Team Naish falling off the pace in the wild distance race and losing his first sprint race in over a year on Sunday. The Danish Viking still managed a 3rd place on Sunday though, which was enough to elevate him up to 5th overall just ahead of France’s Arthur Arutkin, however it wasn’t enough to stop him sliding down the leaderboard after his 12-month-old winner’s points expired. And while it wasn’t the best weekend for the ONE crew, with Paul Jackson and Jake Jensen finishing outside the top 15 and Angie missing the podium, the team had something to cheer about after Mo Freitas was victorious in the sprint on a borrowed ONE board. In an amazing story, Mo creased his own board in the semis after a clash of rails freak accident almost cost him a spot in the final. But even though he was still able to finish that round and make it through to the final, Mo needed to quickly find some new equipment for the decider, borrowing Jacko’s board for the final where he would race away to victory. Sounds like it was a wild weekend on the water all round. * Note: the tie-breaker was the highest individual result; or in the case of identical scores between the two races (eg. Mo and Connor) it was weighted on the distance. * Note: the tie-breaker was the highest individual result; or in the case of identical scores between the two races (eg. Fiona and Candice) it was weighted on the distance.